There are two different sets of configuration files: those for client programs (that is, ssh, scp, and sftp), and those for the server (the sshd daemon). System-wide SSH configuration information is stored in the /etc/ssh/ directory as described in Table 12.1, “System-wide configuration files”. User-specific SSH configuration information is stored in ~/.ssh/ within the user's home directory as described in Table 12.2, “User-specific configuration files”. /etc/ssh/moduli Contains Diffie-Hellman groups used for the Diffie-Hellman key exchange which is critical for constructing a secure transport layer. When keys are exchanged at the beginning of an SSH session, a shared, secret value is created which cannot be determined by either party alone. This value is then used to provide host authentication. /etc/ssh/ssh_config The default SSH client configuration file. Note that it is overridden by ~/.ssh/config if it exists. /etc/ssh/sshd_config The configuration file for the sshd daemon. /etc/ssh/ssh_host_ecdsa_key The ECDSA private key used by the sshd daemon. /etc/ssh/ssh_host_ecdsa_key.pub The ECDSA public key used by the sshd daemon. /etc/ssh/ssh_host_rsa_key The RSA private key used by the sshd daemon for version 2 of the SSH protocol. /etc/ssh/ssh_host_rsa_key.pub The RSA public key used by the sshd daemon for version 2 of the SSH protocol. /etc/pam.d/sshd The PAM configuration file for the sshd daemon. /etc/sysconfig/sshd Configuration file for the sshd service. ~/.ssh/authorized_keys Holds a list of authorized public keys for servers. When the client connects to a server, the server authenticates the client by checking its signed public key stored within this file. ~/.ssh/id_ecdsa Contains the ECDSA private key of the user. ~/.ssh/id_ecdsa.pub The ECDSA public key of the user. ~/.ssh/id_rsa The RSA private key used by ssh for version 2 of the SSH protocol. ~/.ssh/id_rsa.pub The RSA public key used by ssh for version 2 of the SSH protocol. ~/.ssh/known_hosts Contains host keys of SSH servers accessed by the user. This file is very important for ensuring that the SSH client is connecting to the correct SSH server. If setting up an SSH server, do not turn off the Privilege Separation feature by using the UsePrivilegeSeparation no directive in the /etc/ssh/sshd_config file. Turning off Privilege Separation disables many security features and exposes the server to potential security vulnerabilities and targeted attacks. For more information about UsePrivilegeSeparation, see the sshd_config(5) manual page or the What is the significance of UsePrivilegeSeparation directive in /etc/ssh/sshd_config file and how to test it ? Red Hat Knowledgebase article. In order to run an OpenSSH server, you must have the openssh-server package installed. For more information on how to install new packages, see Section 9.2.4, “Installing Packages”. For more information on how to manage system services in Red Hat Enterprise Linux, see Chapter 10, Managing Services with systemd. To prevent this, you can backup the relevant files from the /etc/ssh/ directory. See Table 12.1, “System-wide configuration files” for a complete list, and restore the files whenever you reinstall the system. 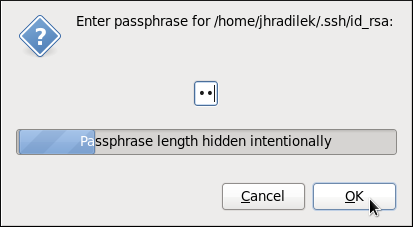 For SSH to be truly effective, using insecure connection protocols should be prohibited. Otherwise, a user's password may be protected using SSH for one session, only to be captured later while logging in using Telnet. Some services to disable include telnet, rsh, rlogin, and vsftpd. For information on how to configure the vsftpd service, see Section 16.2, “FTP”. To learn how to manage system services in Red Hat Enterprise Linux 7, read Chapter 10, Managing Services with systemd. Red Hat Enterprise Linux 7 uses SSH Protocol 2 and RSA keys by default (see Section 12.1.3, “Protocol Versions” for more information). To get an MD5 key fingerprint, which was the default fingerprint in previous versions, use the ssh-keygen command with the -E md5 option. See Section 12.2.4.2, “Configuring ssh-agent” for information on how to set up your system to remember the passphrase. 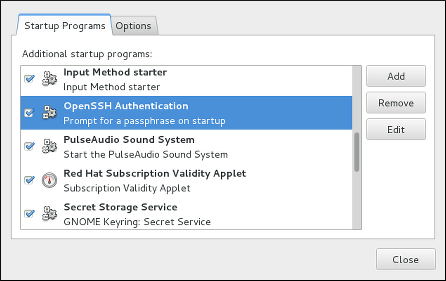 Make sure you have the openssh-askpass package installed. If not, see Section 9.2.4, “Installing Packages” for more information on how to install new packages in Red Hat Enterprise Linux. 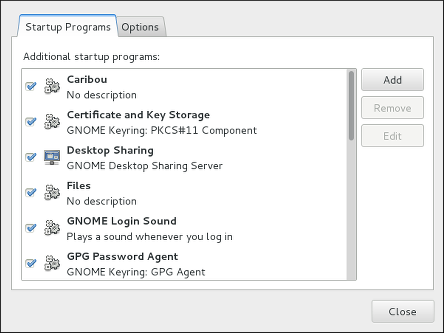 Press the Super key to enter the Activities Overview, type Startup Applications and then press Enter. The Startup Applications Preferences tool appears. The tab containing a list of available startup programs will be shown by default. The Super key appears in a variety of guises, depending on the keyboard and other hardware, but often as either the Windows or Command key, and typically to the left of the Space bar. Click Add and make sure the checkbox next to the newly added item is selected.